The roots of the Herve family can be traced back to 1607. In that year, Jean-Marie Herve, a sailor from Brittany served the King of France. We are not sure when they bought their Bordeaux estate. However, records show they began bottling their own Bordeaux wine in 1890! That is interesting to note, because in those days, most wines were bottled and sold by negociants. That makes Chateau Moulin Haut Laroque probably the first property in Fronsac, as well as in all of Bordeaux to bottle and sell their own wine. Chateau Moulin Haut Laroque is owned by the Herve family and managed by Jean-Noel Herve. In 1999, the cellars of Chateau Moulin Haut Laroque were completely updated and modernized as well as all fed using only gravity. The 16 hectare Fronsac vineyard of Moulin Haut Laroque is planted to 65% Merlot, 20% Cabernet Franc, 10% Cabernet Sauvignon and 5% Malbec. The terroir is clay and limestone soils. You can look at the vineyard quite easily, if you divide it into 2 parts. They own vines on the plateau of Fronsac, not far from Haut Carles with heavy limestone deposits and they own other parcels on the slopes close to the chateau which has more clay. The vineyard is planted to a vine density that ranges from 5,500 to 6,700 vines per hectare. Newer plantings are done at the higher levels of vine density. There are old Cabernet Franc vines that are more than 70 years of age, which add a lot to the wines character and concentration. They also have some of the oldest Malbec vines in Bordeaux, which are almost 80 years old! To produce the wine of Chateau Moulin Haut Laroque, vinification takes place in small, temperature controlled, stainless steel vats. 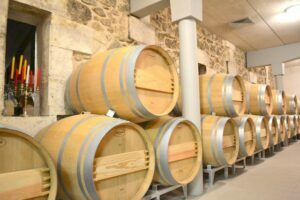 Malolactic fermentation takes place in French oak barrels. All wine is moved entirely by gravity. The wine of Chateau Moulin Haut Laroque is then aged in an average of 35% new, French oak barrels for about 18 months before bottling. Chateau Moulin Haut Laroque is better with at least 2-3 years of aging in good vintages. Young vintages can be decanted for up to 1 hour, helping the wine soften to help develop the aromatic character. Older vintages might need very little decanting, just enough to remove the sediment. Chateau Moulin Haut Laroque offers its best drinking and should reach peak maturity between 3-12 years of age after the vintage. Chateau Moulin Haut Laroque is best served at 15.5 degrees Celsius, 60 degrees Fahrenheit. The cool, almost cellar temperature gives the wine more freshness and lift. Chateau Moulin Haut Laroque is best paired with all types of classic meat dishes, veal, pork, beef, lamb, duck, game, roast chicken, roasted, braised and grilled dishes. Chateau Moulin Haut Laroque is also good when matched with Asian dishes, rich fish courses like tuna, mushrooms and pasta. Located in the Canon Fronsac appellation, Chateau Moulin Haut Laroque is a value priced Bordeaux wine that remains one of the best over performers in the Right Bank. Michel Rolland is the winemaking consultant. To help insure the wine is at the highest level of quality, the estate also produces a second wine, Chateau Herve Laroque. In addition, the owners of Chateau Moulin Haut Laroque also produce two other wines; Fronsac par Jean Noel Herve and Chateau Cardeneau. Chateau Moulin Haut Laroque is a great example of a Bordeaux value wine that combines quality, style and price. Smoke, espresso, licorice and cherry notes on the nose move right through to the fresh, soft, round, sweet and fruity finish. You can enjoy this young but a few years will allow the oak to better integrate with the wine. Soft tannins, medium bodied, with juicy black raspberries, dark chocolate and espresso in the nose and on the palate. Really silky on the palate, with loads of fresh, sweet, ripe, cherries, espresso and licorice that should offer delicious tasting early. Showing deep color, the wine is fresh, soft and round, with a black cherry filled personality. This really put on weight and added complexity during the aging. The wine, produced from a blend of 65% Merlot, 20% Cabernet Franc, 10% Cabernet Sauvignon and 5% Malbec easily serves up an earthy espresso driven, cherry and licorice personality with a soft, smooth finish. Give it 2-3 years to continue filling out. This screaming value offers licorice, black and blue fruits, jam, coffee and earthy scents, ripe tannins and a polished, long, rich finish. Flashy, forward and already fun to drink, the wine pops with licorice, black cherries and earth. Deeply colored, lushly textured and open, this should be able to age, as well as offer pleasure in its youth. Savvy shoppers should be able to find this Bordeaux value wine for under $30. Licorice, sweet red and black fruit, spice and stone scents lead to a round, medium bodied wine that is already showing well. From a blend of 65% Merlot, 20% Cabernet Franc, 10% Cabernet Sauvignon and 5% Malbec, I'd drink this fun wine over the next 5-8 years. This is loaded with licorice, chocolate covered cherries, minerality, spice box and coffee bean. Round, ripe, sweet and delicious, this plush wine is already showing well and should give pleasure for at least another decade. Smoke, cherry, black raspberry and fennel, soft textures and a round, crowd pleasing finish. This is drinking great today. This plush, ready drink, pleasure machine of a wine is filled with ripe, juicy black raspberries, licorice and cocoa. This is a sold value wine.